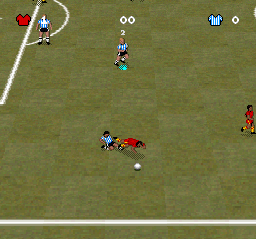 Total Football is an unreleased soccer game developed by Domark and published by Acclaim. Thanks to Petrovic for bringing this game to my attention, and for sending me the magazine scan! I originally thought I had found all of the leaked binaries of unreleased games that were out there, but amazingly, there was one that did not grab my attention. 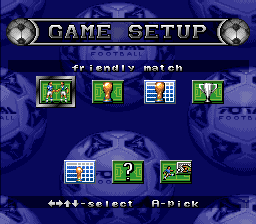 Total Football is a soccer game that was going to be published by Acclaim, but probably due to the fact that it is a soccer game, and there are dozens of soccer games for the SNES, it was not really something that caught my attention. 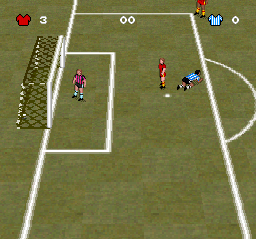 Acclaim released another soccer game called Champions World Class Soccer, but it is completely unrelated to this game. 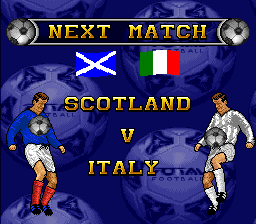 Total Soccer was commercially released on Megadrive (Genesis) and Amiga. 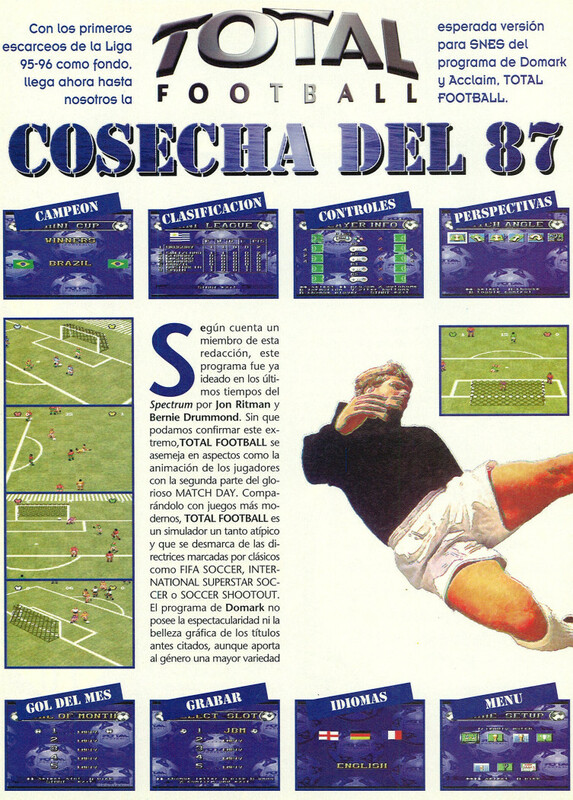 The game was featured in the October 1995 issue of the Spanish magazine, Super Juegos. It must have been fairly close to release to have been sent to magazines for review. Total Football was leaked by the scene group Napalm on September 6, 1995. One amusing thing included in the scene release is a transcription of the controversial racist text that appeared in the September 1995 issue of Diehard Gamefan. There isn't much to say about the game, it is a standard soccer game. It is five player compatible, though. One interesting aspect is that you can select multiple camera views, so you can play the perspective that suits your preference. Another unique gameplay possibility is to set it so that you only control a single player - it is not possible to change even if another player on your team has the ball. By the looks of things, the leaked binary is the same version as the one reviewed by Super Juegos. It looks pretty much like a complete game. One thing to note, if you try playing this game in SNES9x, it is very glitchy and prone to crashing. I believe the cause of this is that the emulator does not properly map the correct SRAM size, and therefore the game is reading in garbage data. If you play it in Higan with the correct mapping (included below), the game plays properly. Also note that you must play the game in PAL mode, or you will also get glitches. Tackling The celebrations after scoring a goal are amusing - in this one the person runs around like a dog.